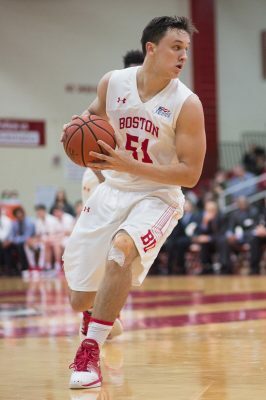 Boston University men’s basketball was unable to get revenge on American University in a 66-70 defeat at Case Gym Wednesday. The Terriers (9-11, 2-5 Patriot League) were on familiar terms with the Eagles (9-9, 3-4 Patriot League), having played them three weeks ago to begin conference play. In that game, American point guard Sa’eed Nelson and forward Sam Iorio combined for more than 50 points in an 86-74 win for the Eagles in Washington D.C. This time around, the venue changed but the end result stayed the same. American jumped out to a 19-7 lead in the first eight minutes of the game, but the Terriers went on a 15-3 run to take the lead themselves. In that stretch, junior forward Max Mahoney had five points and sophomore guard Javante McCoy made a three to give BU a 22-21 lead. McCoy went down hard early in the game after converting a layup and stayed down while holding his head and neck area. He returned to the game after the next timeout and did not seem to be hampered by injury. At the end of the first half, American led 35-31. Once again, Mahoney led the team with 11 points at the break and five rebounds. When the Terriers stalled on offense, they had Mahoney to throw the ball to. More often than not, he beat his defenders in the post for a bucket. The story of the first half was American’s star point guard Sa’eed Nelson. Nelson was all over the floor, leading the Eagles in every facet of the game with 10 points, five assists, four rebounds and three steals at halftime. Nelson’s defense and energy was a problem all night for BU. The Patriot League preseason player of the year single-handedly stopped a BU comeback in the second half. After the Terriers held a brief lead in the beginning of the frame, Nelson converted on back-to-back and-ones at the rim, giving the Eagles a lead they wouldn’t give up. American stretched their lead out to nine with seven minutes to go, and the Terriers were able to cut it to four with 1:37 left. Mahoney continued his strong play over to the second half, cleaning up misses and scoring down low to finish with 24 points and 13 rebounds, his fourth double-double of the year. However, Nelson ended any hope of a comeback. He came up with deflections on the next two possessions, which resulted in two turnovers for BU and more points for the Eagles. Turnovers were a problem all night for the Terriers, as they had 18 in total. When the dust cleared, Nelson had scored 26 points, dished out six assists and registered five steals, all game highs for either team. With the loss, BU has now dropped three straight conference games after starting 1-2. Up next, they have a road game against Lehigh University, who is tied for second in the Patriot League, and two games versus College of the Holy Cross.